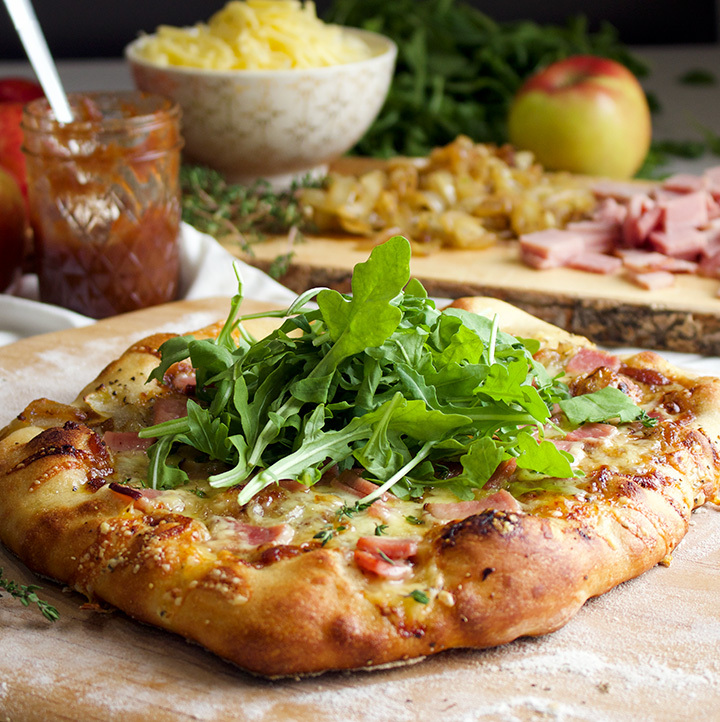 This is not your ordinary pizza. 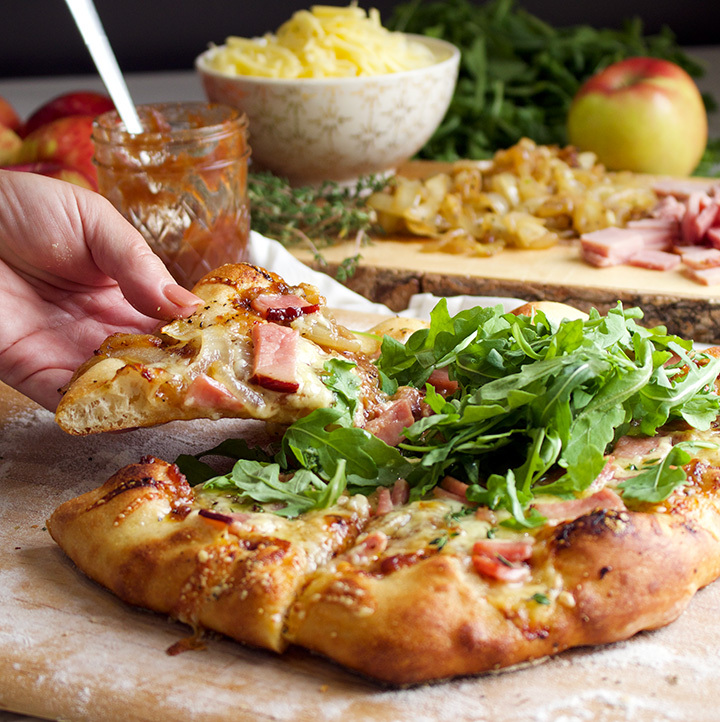 Shake up pizza night by swapping out the tomato sauce for apple butter and topping it with caramelized onions, white cheddar cheese, applewood smoked ham, and a pile of fresh arugula. You might never go back to plain old pepperoni again. 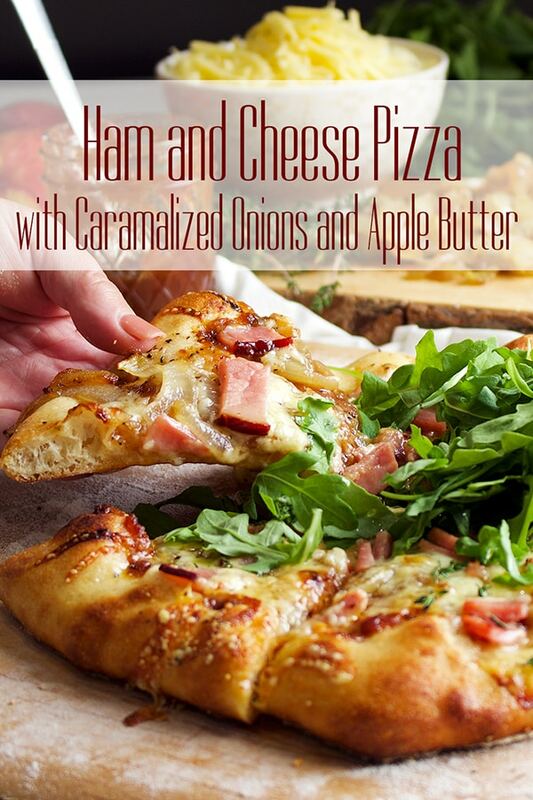 When I put a slice of this pizza in front of my husband and explained that it was made with ham and cheese and apple butter, he was… let’s just say, a bit skeptical. Then he ate 4 pieces. So, if you, like my husband, are looking at the screen right now with one eyebrow raised, this short story is the best way I can describe this pizza to you, because you’re going to be blown away with how good it is. And, really. It’s not hard to imagine how good this combination really is. Who doesn’t love a ham and cheddar sandwich, especially if it’s grilled so the ham is warm and fragrant and the cheese is all melty? Or, apple slices dipped in cheese fondue? Or, pork chops sautéed with apples? 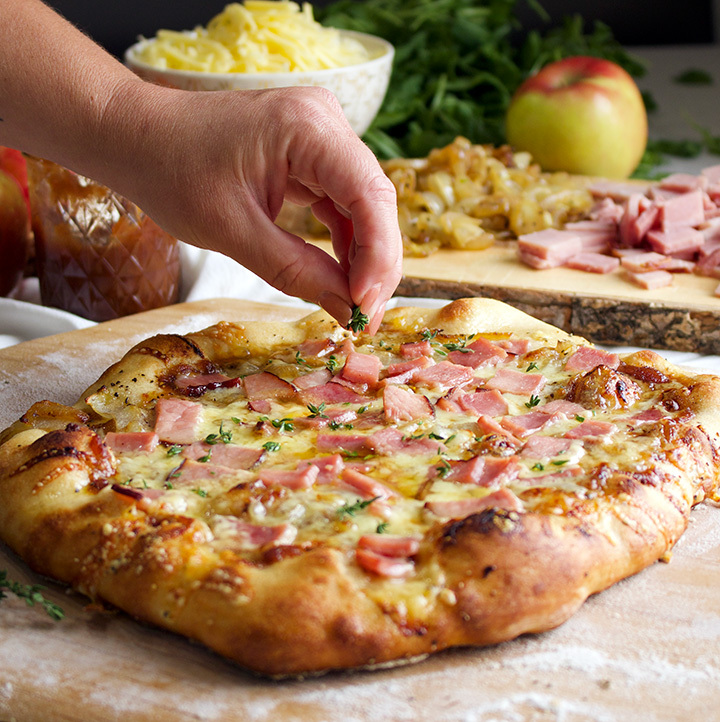 This pizza just takes all that goodness one step further by putting all those flavors together atop a golden, soft and chewy pizza crust. Start with good pizza dough. 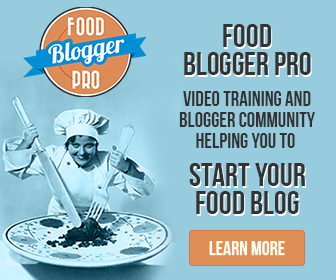 This is my favorite homemade pizza dough recipe. It’s super easy to make and produces the kind of pizza crust I like the most: a bit crispy on the outside, soft and chewy on the inside. The dough mixes up quickly and only needs about an hour to rise. You can also mix up the dough in the morning and leave it to rise in the refrigerator all day, pulling it out that evening when you’re ready to make pizza. Roll out 1/4 of the dough into a rough 12-inch circle. Brush it with some olive oil, then sprinkle on a pinch of crushed red pepper and a few shakes of ground black pepper. Then comes the apple butter. 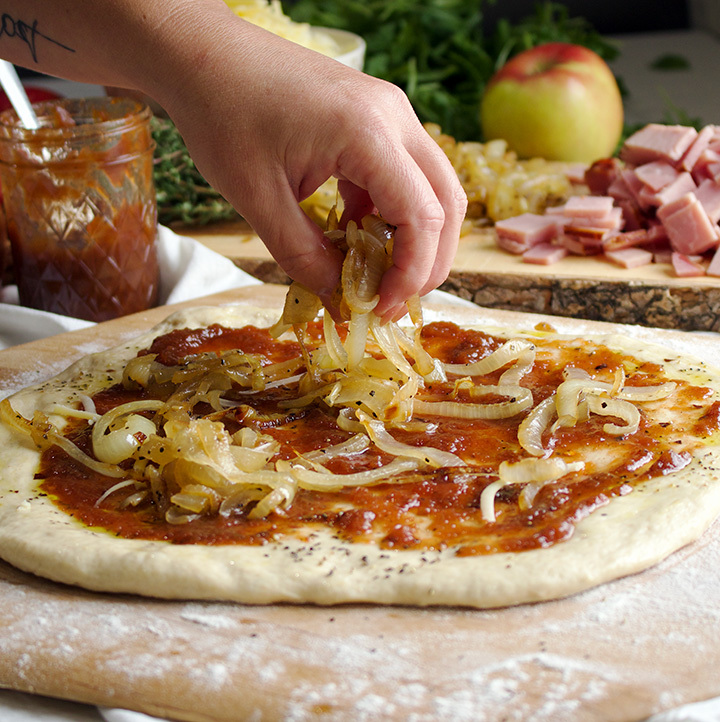 If you’re planning to make this pizza a few days from now, consider making a batch of homemade apple butter. This slow cooker apple butter recipe requires NO coring and peeling of the apples and only about 30-minutes of hands-on work to prepare. Besides being thick and rich and delicious, it will make your whole house smell like apple pie. That said, homemade apple butter is by no means a requirement. Just pick up a jar at your local market, or order some from Amazon. 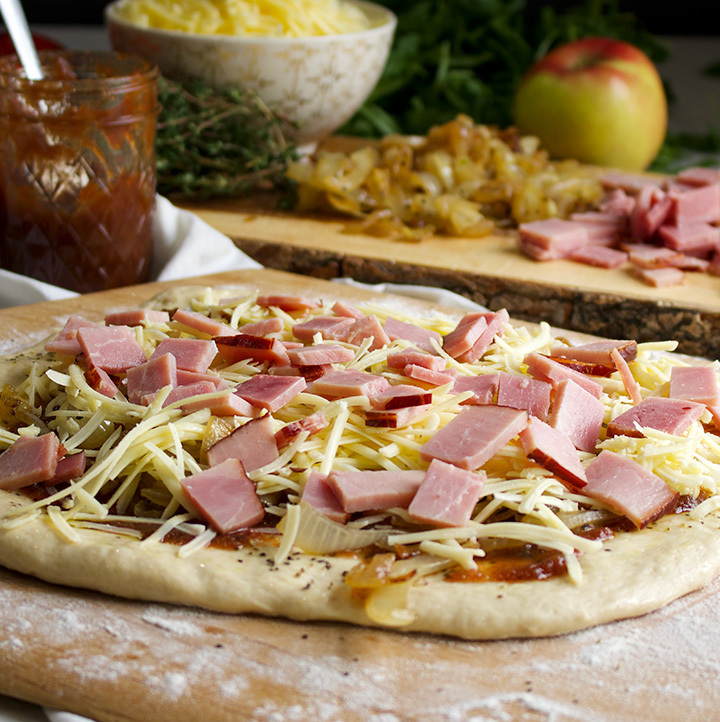 And a generous layer of ham…. Caramelize the onions: Heat 1 tbsp olive oil in a skillet set over medium heat. Add the sliced onions, sprinkle with a bit of salt and pepper (about 1/2 tsp of each), and cook, stirring occasionally, until the onions are a deep golden brown, approximately 15 minutes. Scoop the onions onto a plate and let cool to room temperature. Brush the crust with a bit of olive oil, coating the entire surface with a thin layer. Sprinkle with a pinch of crushed red pepper and a few shakes of ground black pepper. 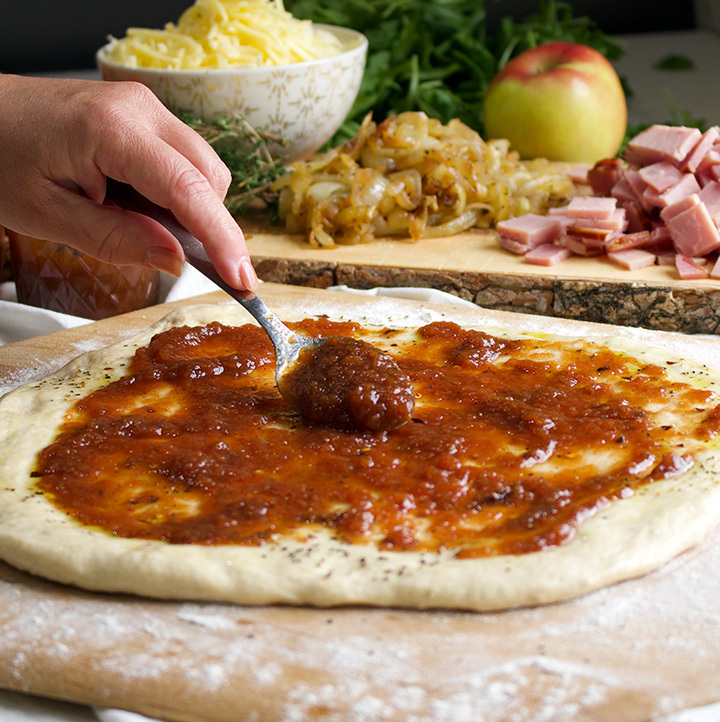 Spread about 3 tbsp apple butter over the crust, leaving about 1-inch of dough around the circumference of the pizza. Sprinkle about 1/4 of the caramelized onions over the apple butter, then sprinkle 1/4 of the grated cheese over the onions, followed by 1/4 of the diced ham. 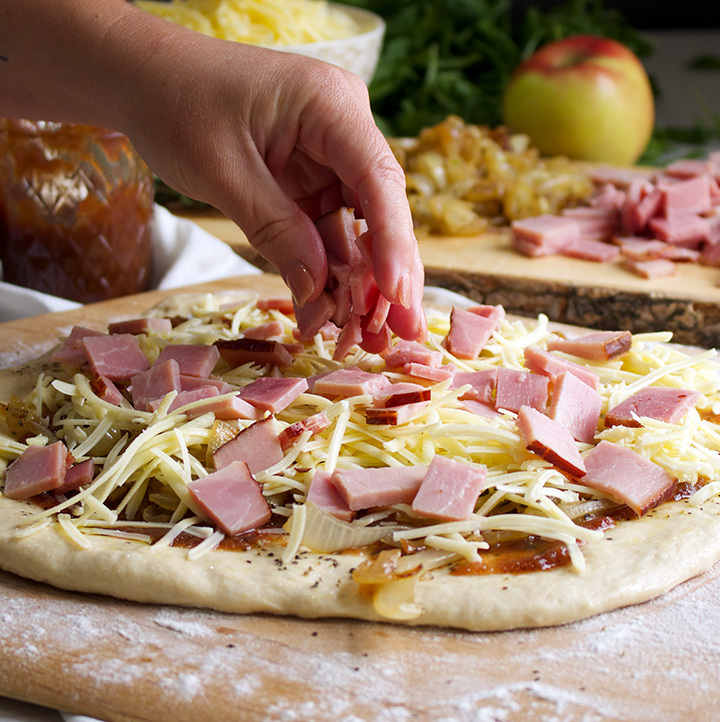 Slide the pizza into the oven and bake for 10-12 minutes, until the crust is golden and the cheese is bubbly and just begging to brown in a few places. 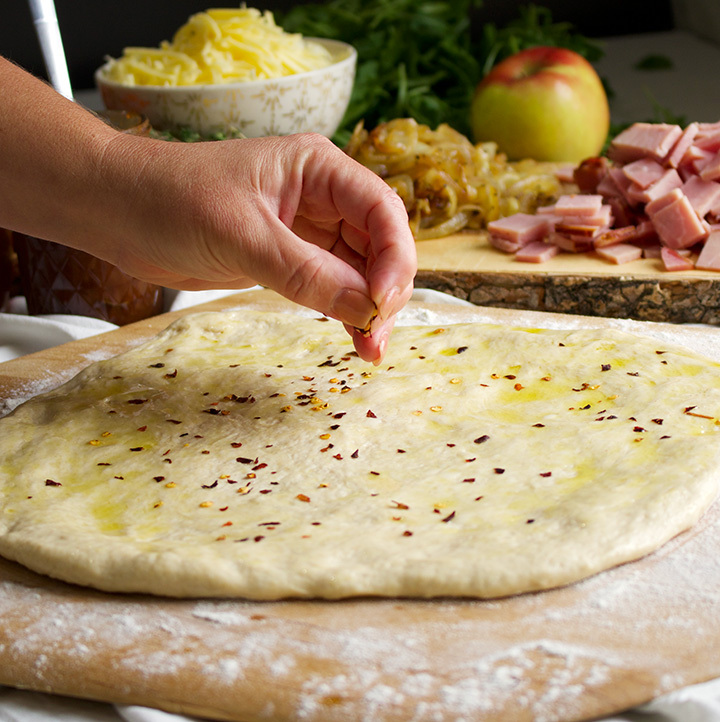 Remove the pizza from the oven and sprinkle with 1 tsp of fresh thyme. 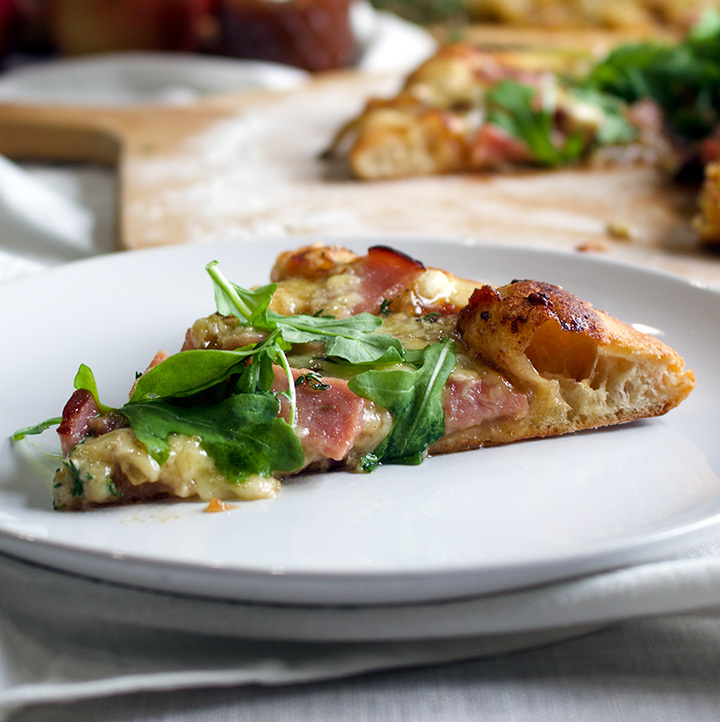 Top with 2 cups of arugula, slice and serve. 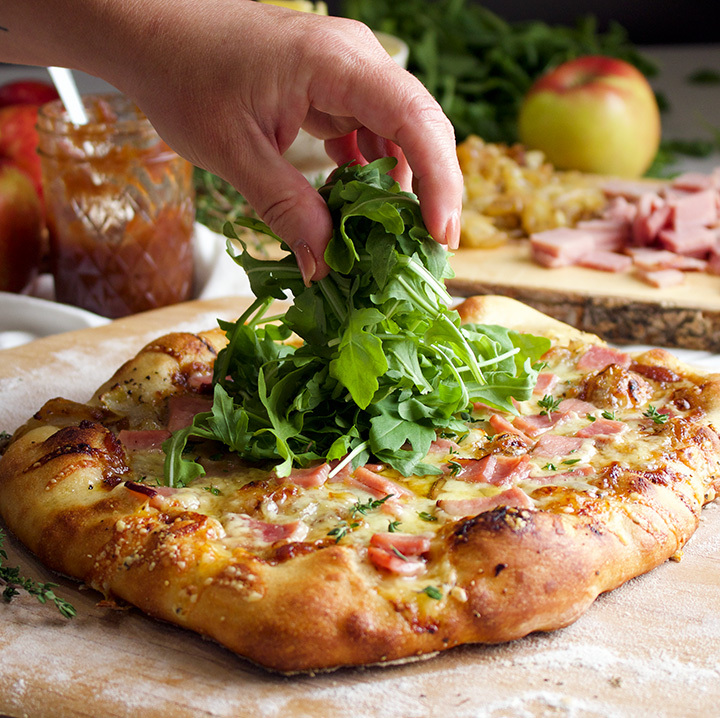 Bake pizza in a very hot oven – 500 degrees – and on a pizza stone if you have one. I’ve had my pizza stone for at least 20 years and use it all the time. 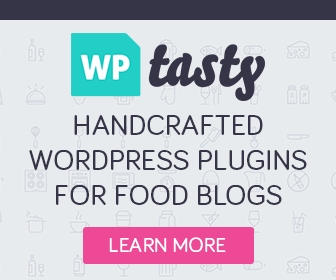 It produces deliciously crisp crust, but if you don’t have one, not to worry. You can still get good results by using an overturned and preheated rimmed baking sheet, set on the lowest oven rack. If you are using a baking stone, I’d suggest preheating the oven for at least 30 minutes before baking your pizzas. 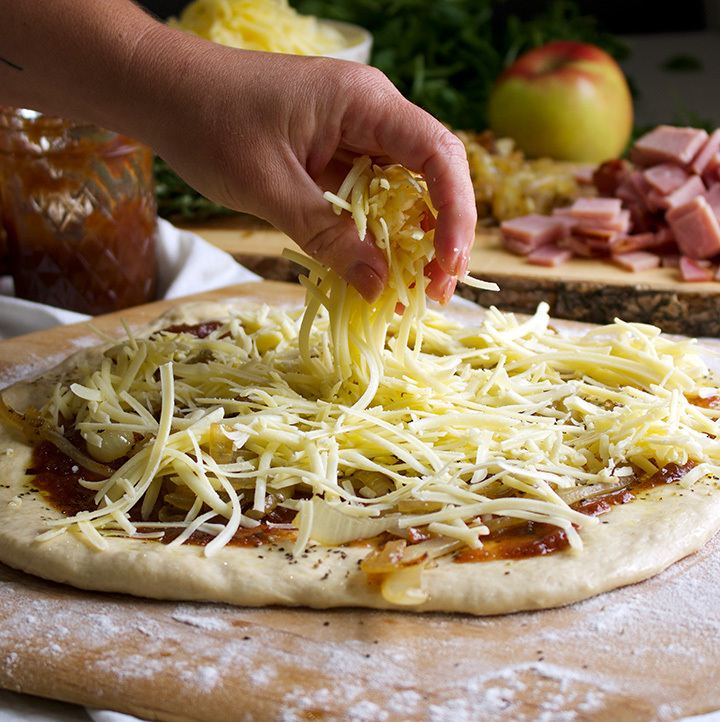 If this is your first time working with homemade pizza dough, I found this excellent tutorial about using your hands to stretch pizza dough. I generally stretch and pat my pizza dough into shape on a lightly floured work surface, and then place it on a sheet of parchment that’s laid over a pizza peel before adding toppings. 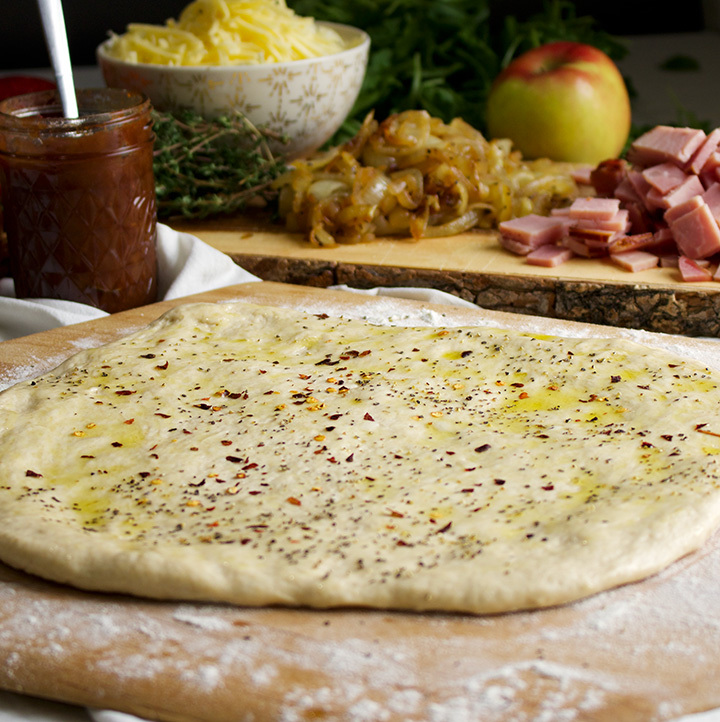 Having parchment under the dough makes it really easy to slide the pizza, parchment and all, in and out of the oven. If you don’t have a pizza peel, an open sided cookie sheet works well too. Wow! This pizza looks so delicious! Thank you Karly! It’s 😋.